As British Gypsum celebrates 100 years in the industry it wants to champion the trade, and has been out on the road meeting some of the unsung plastering heroes. 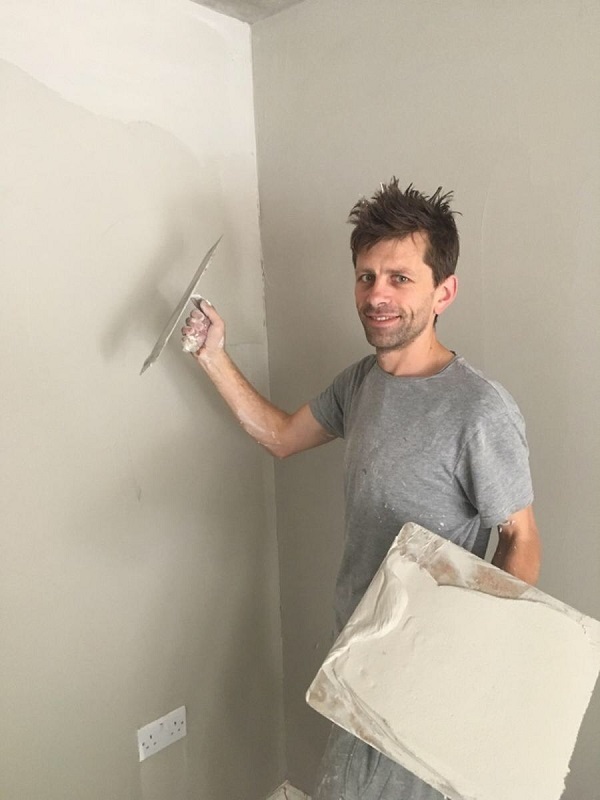 In this fifth feature, British Gypsum catches up with plastering business owner Aaron Pearson of Anubis Projects. When I first started working in the building trade about nineteen years ago I used to just love plastering. I used to literally stand there watching the plasterers, fascinated by them and the work they were doing. I have always liked straight lines and making things right, so I knew plastering would be the perfect fit for me. So I quit my building job and went down to practically nothing so I could retrain as a plasterer. I was living on my own at the time and I just put all my efforts into training up and I took things from there. And I am so glad now that I made that sacrifice back then. I gradually grew my client base and reputation and have been out on my own for five years now. For the last two of those I have been running my own plastering business and things are going really well. I am very competitive and believe that you’ve got to be the best at everything you do. In my opinion, I can’t be beaten on speed or quality – on a domestic job you will not find a keener plasterer and on bigger jobs you will not find a faster one! I firmly believe that anything is possible and that is something I always try to pass onto my son as well as the people I work with. For the rest of this series, click here, here, here and here. For more articles on plastering click here. Working with British Gypsum has been really eye opening for me and has also been a really solid foundation for helping to build my business. I can present actual samples to my clients and clearly show them the benefits of the plaster I am using. Because I am a British Gypsum Certified Plasterer I can give a two-year guarantee with the work that I complete and when clients hear this they can see the added value and are always more than satisfied with the end result. In our trade it is so important to train other people and pass on the skills that we have learned. I have so many great men to thank for training me through the years and for always believing in me. Now it is my turn to do the same. I love supporting apprentices and regularly have new ones coming on and I relish the idea of passing on my expertise. I have already trained six or seven plasterers and they are all still working in the industry, which is inspiring to see. One has even flown the nest and managed to go out alone. But he still constantly supports me. I am not on Social Media at all but I know he has flooded the Internet campaigning for me for a plasterer award I have been nominated for. I would really like to specialise exclusively in premium plasters as there is definitely a market for it and it really is a beneficial way of working. The finishes you can achieve are second to none. Thistle DuraFinish is an absolutely brilliant plaster to work with. It is not as intense as some of the other plasters and you can do so much with it. And better still, the standard of finish is absolutely beautiful and will stand the test of time because it is 60 per cent tougher than standard plaster. It really can’t be beaten. I would absolutely love to offer an apprenticeship that really does just concentrate on such premium products. Then the young lads will be taught about all these amazing products, something we did not have the luxury of when we were first starting out. I like to think of it as an apprenticeship like no other! Having retrained, gone out on my own and then launched my own business I have learned a lot. I can’t emphasise enough how important relationships are. I absolutely love the plastering community and have made life long friends through the years. I always like to remember, “Be careful who you tread on, on the way up, because you will need them on the way back down” and it is the best advice I can pass onto anyone wanting to develop a career in any walk of life. After working his way up from nowhere to now running his own business, Aaron Pearson is a fantastic example of making a successful career in the plastering trade. Look out for British Gypsum’s next interview in the next issue.